Karen Stone is director of design for Knoll and is responsible for the design of Knoll Showrooms, Knoll Retail Shops, exhibits and trade shows worldwide; for bringing sustainable design, new materials and technologies to Knoll product design; and for establishing direction for new finishes for Knoll products. 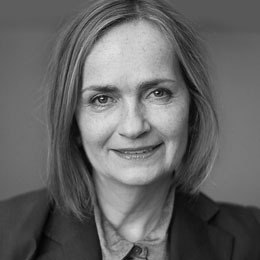 Since joining Knoll in 1991, her award-winning work with the company has been cited in publications including ID, Domus, Interiors, and Inside Design Now. She has created a new line of products for Knoll Shop retail store and established the Knoll Design Student Internship program. An adjunct professor of industrial design at Pratt Institute, Stone has been guest teacher at Bauhaus Universitat-Weimar and Tsinghua University, Beijing; visiting professor at Samsung Art and Design Institute; and has led projects with Warsaw Academy of Fine Arts and Keio University. She serves as Pratt faculty advisor to the IDSA Student Chapter, leads design workshops at New York City High Schools and was a panelist for Design for Social Impact May 2016, Women x Design May 2017, and Design50 October 2018. She holds a BS in industrial design from Ohio State University, an MID from Pratt Institute, and has studied at Oxford University. In 2018, she received a Distinguished Alumni Award for Professional Achievement from OSU and currently serves on the Board of the Brooklyn Arts Council.